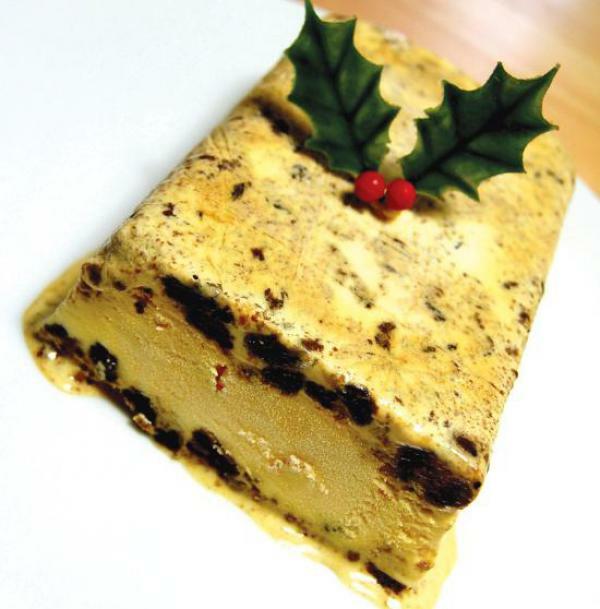 A delightful frozen dessert using fruit cake and vanilla ice cream. Great for using up cake which may be past its best, but equally as good using fresh fruit cake. Makes an ideal lighter alternative to Christmas pudding but with the same Christmassy flavours. Line a 20x10cm/8x4” loaf tin with a double layer of clingfilm making sure you have a 7.5cm/3-inch overhang of clingfilm on all sides. Set aside. In a large bowl mix together the fruitcake and half the ice cream until well blended. Using a spatula or large knife and a "cutting" motion to mix works best. Place half the cake mixture into the loaf tin, spreading it evenly over the bottom and making sure you press it well down and into the corners. Place the remaining plain ice cream over the top of that, spreading it evenly as above then finally place the remaining cake mixture over the top, again spreading it evenly and pressing down firmly to ensure there aren’t any air pockets. Fold the clingfilm overhang over the top securely then freeze for at least 6- 8 hours until completely frozen. To serve - unmold the terrine onto a flat surface, remove the clingfilm and serve it sliced.